Website: The Queen shant allow it. Maybe it's here. See wikipedia either way. Bitter finish, smokey, slightly nutty flavors. Maybe hints of fruit? Whatever, snob. This is a bottle conditioned traditional English ale with a damn lot of character. 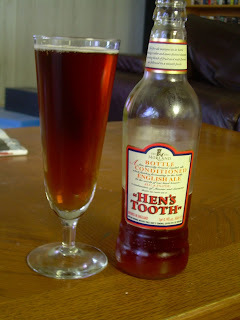 The aromas remind me of Heineken, which is obviously worrisome to a Tooth virgin. Worry not, ye olde drunkarrrrrrds, it tastes nothing like that garbage. I have a feeling if I drank 3 or more of these I'd be calling people "Gub'naa" pretty frequently. A pleasant brew to drink, certainly.